There is more to trekking in Torres del Paine than the W trek or the Circuit. Going off-the-beaten-track can take you scrambling up peaks for views of the icecap, or searching for fossils in the Baguales range. Those who venture into the lesser-visited valleys are rewarded with pristine forests, sightings of huemul deer or puma, and wild campsites all to yourself. Torres del Paine's main trekking routes are popular and do get busy; every day in high season, around 300 people hike to the base of the towers. By contrast, there are some off-the-beaten-track trails visited by only 100 people a year, and bushwhacking can take you to places that have only ever seen 100 people. Torres del Paine is packed with wild, contrasting landscapes, many of which can only be experienced by escaping the main Paine range. Escape the crowds by weaving in some off-the-beaten-track days to your classic multi-day hike. If you're active and have some hiking experience, many of these trails are of a similar level to those found on the W and Circuit, and you can still benefit from the experience and knowledge of our local guides. For those seeking challenging trekking, there are a handful of far-flung passes and peaks located deep in the backcountry that demand a semi-technical approach. This isn't just off the beaten track, but off the trail altogether! 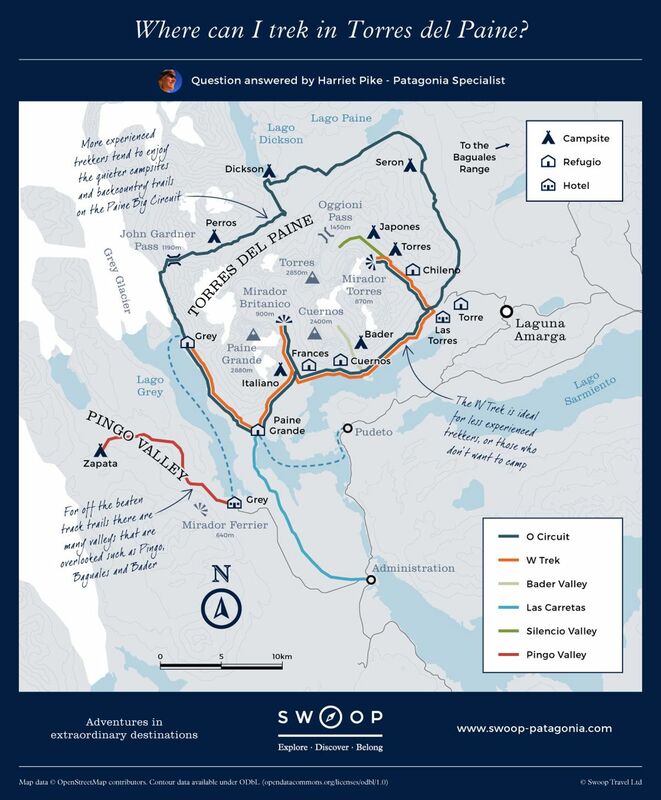 Where can I trek in Torres del Paine? These valleys are off-limits to self-guided hikers, so receive significantly fewer visitors in comparison to the main trails in the park. The Silencio Valley is located at the top of the Ascencio Valley (commonly hiked by those visiting the Base of the Towers). Break from the main trail at the top of the valley, continuing north to the mighty granite faces of Cerro Fortaleza (2688m) and Cerro Escudo aka "The Shield" (2240m), both very popular with climbers. Cerro Tridente (1978m), the famous triple-peak, is also situated here. Along the trail is Japones camp, a small, sheltered area of woodland where there's a rudimentary shack to seek refuge. This camp is also used by those trekking the Oggioni Pass, which slices through the backcountry towards Refugio Dickson. Along Bader valley is a basic climber's camp where it is possible to stay, as long as you're accompanied by a guide. Located in the dense forest west of Torres del Paine, the Pingo Valley follows the Pingo River towards the South Patagonian Ice Cap. The valley remains perfectly preserved, untouched by the devastating forest fires of 2012, so the moss, lichen and ferns have flourished. Palaeontologists have also discovered an abundance of ancient marine fossils dating back 250 million years ago in this area of the park. Wild baguales (bulls) roam free in the valley and their nighttime shrieks give this whole area a very pre-historic feel. The Pingo Valley is Torres del Paine's very own answer to Jurassic Park! 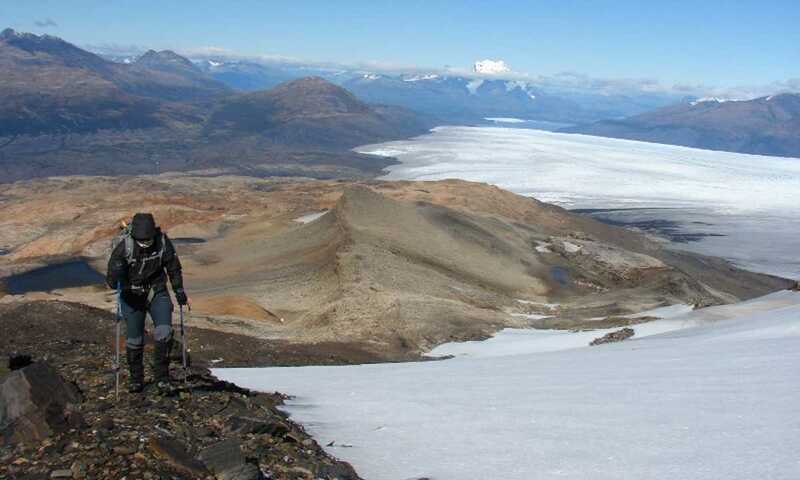 At the head of the valley awaits Cerro Zapata (1077m) which can be summited without technical experience, rewarding its conquerors with stunning views of the ice cap, Tyndall Glacier and Lago Grey. In Sierra Baguales, rolling hills of arid pampa stretch east of the Paine massif all the way to the Argentinean border. This area boasts an incredible geologic history and wide open spaces where you likely won't encounter another person for the entire time you're there. With a fascinating past of ancient volcanoes and sedimentary rock formations, the Baguales Valley is a hotbed of fossils, and it's a popular spot for paleontologists to search for remnants of the past. Old puestos (small, basic shelters) are scattered across the landscape, offering a place to rest for Chilean baqueanos who herd sheep and cattle around the valley. Several fossilized shark teeth have been found in this area, as well as fossils of different shellfish species, hinting at its marine past when the Atlantic Ocean stretched all the way inland. Many people choose to hike the main trails alone and then meet a guide to trek up to the ridges and peaks that few have the privilege of experiencing. Out here, you'll need to be prepared to camp and handle some demanding terrain. Yes. CONAF, the Chilean National Park Authority, only allow visitors into the off-the-beaten-track areas of the national park when accompanied by a guide, so it is simply not possible to visit these areas without one. In areas outside the national park, you will be hiking on private land and the landowner will not allow you to hike independently. What are the facilities like on the trails? If you are camping wild at Bader, Japones or Pingo camp, then you won't find any facilities. Your guide will carry a small shovel and you will need to dig a hole (try to dig down one foot) and bury your excrement. Any toilet paper should be bagged and taken with you, many people choose to carry a small bag specifically for this purpose. Can I get off-the-beaten-track without camping? Many of the luxury lodges organise incredible day hikes into Sierra Baguales, the Dorotea Range or Pingo Valley. You can often also explore the area around the lodge, so if you choose one in a more remote location, you're already off-the-beaten-track as soon as you walk out of the door. Will I miss out on the main sites? The highlights of Torres del Paine are the towers, the French Valley and Grey Glacier. You can see the towers from Cerro Paine instead of from the more popular towers viewpoint. You can look at the Cuernos from the Bader Valley instead of the French Valley, and you can visit remoter (although less massive) glaciers in the Pingo Valley instead of Glacier Grey. There is a reason the more common viewpoints are popular, so you may want to combine some days on the main trails with some days off-the-beaten-track. For those with a bit more budget to work with, combine private accommodation with the opportunity to hike a few days on those famous hiking trails.